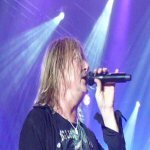 Def Leppard singer Joe Elliott was interviewed after the Down 'n' Outz Planet Rockstock show last night and talked about the 2015 world tour. Joe talked about the performance, the difference between Down 'n' Outz and Def Leppard, the current UK tour, future plans, the proposed third album of original material, the Def Leppard 2015 tour/album and his radio show. Joe said the tour would likely start in April during a November radio interview. Watch the full 4 minute video interview below conducted right after Joe left the stage. "Yeah we've got European dates booked. We'll have a British tour when the album's ready to go. Probably towards the end of 2015. There's Canadian shows. They'll be an American tour. There's Japan, Australia. It's a big world these days and you've gotta go where you're needed and wanted. But we'll definitely be playing the UK for sure."